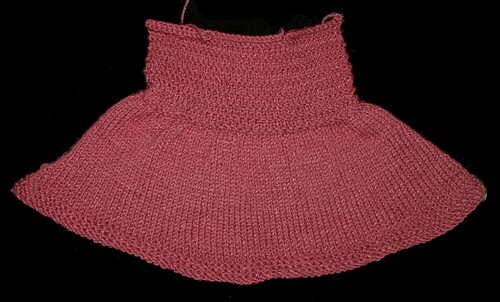 I have finished the back piece of the knitted baby jacket. I have a started on the front left side. I have pretty much run out of the cameo rose color I have a tiny bit left that will be used on the cuffs of the sleeves to pull it all together. I am now using the color new berry. This will be used on both sleeves, left and right sides of the front. 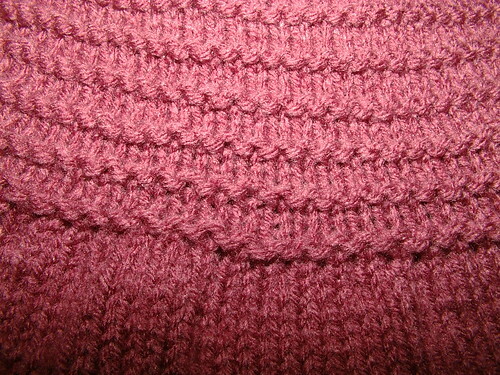 The pattern calls for crocheted ties but I will probably use metal sweater closures on it instead. I am thinking I will do duplicate stitch around the hem with little hearts in the cameo rose on the front and in the new berry on the back to pull it together all the more. The other piece of knitting you see is the start of a gray wool shawl or headband my children want it made into a headband. As usual once I figure out a little bit of a technique I start designing my own ideas so I can get a hang of a technique. If I work on my own patterns then I get a better grip of what the technique can do as I have to work out what the item will look like before I make it. With a pattern that someone else has done I am just following stitches and don't always know where the pattern is going next. In this case it has a boarder of knit that is 20 stitches wide increasing on last stitch on both sides and in the middle are blocks that are 20 stitches wide by 20 stitches tall except the middle one is 21 wide by 20 tall. I know not a fancy pattern but it is an intro pattern for me to create and to make to see if my ideas I can put into the cloth. The yarn is vintage on this shawl. 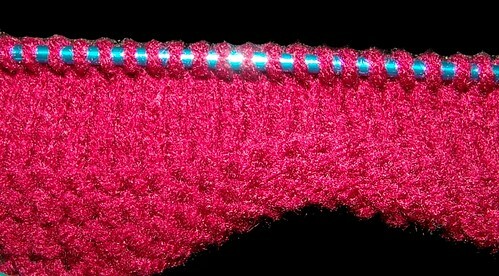 I know a lot of markers I don't know how knitters do this so for me the blue is the front of my work, the pink is the front of those squares and the white is where I switch from one block to another so I don't have to recount every row it just happens at that marker. Is this how knitters do it or is it just me. Maybe in time I can call myself a knitter but not quiet yet give me a few months.